After a busy few weeks at Olympus Dive Center, I have had a chance to reflect on the classes that have gone on and I'd like to share some news on 1 new class in particular. Since the diving in North Carolina is defined by wrecks and the marine life, I wanted to create a course that encompassed both. I focused on the conservation and knowledge base for the protection of sharks off the Crystal coast. I have since created a Shark Conservation course which focuses on the native sand tiger shark (Carcharias taurus) and have taught the course two times in the past two weeks! With all the media attention surrounding shark attacks, shark finning, and culling I felt like it was high time that we started educating people in the species and the fight to save them. I find that the enthusiasm our divers have for the sharks and conservation to usually be inspiring and this week was no different. I had the distinct pleasure of teaching Dale, Joe, Jeff, and Lisa in the subject of shark conservation. We had great discussions during the lecture, the dives were, of course, beautiful and our buddies of the sea definitely out in force and smiling for the cameras. 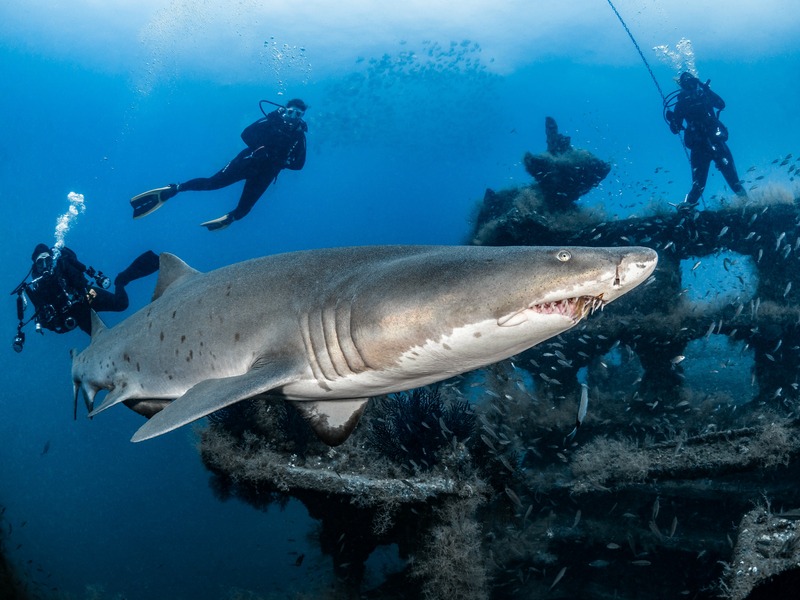 What we tried to do with this course is focus on the sand tiger and how we can be better divers around them and how we can recognize distinctive marks and why these things happen. I also wanted to put photo/video work using still cameras and gopro’s into the mix and I feel like that was a major success as well. Here is a youtube video that was done by Jeff during the course which ended up being fantastic!!! This course is a blast and very informative. The hope is that more people will be getting involved in the movement to protect our shark brethren worldwide. If you are interested in signing up for this course click here for more info.